The AXIe standard reached its 3rd anniversary this month and the interest has been growing for this relatively new standard. It is encouraging to see that AXIe as a technology standard is gaining a firmer foothold in the market place, especially when looking at applications where more complex test equipment is required and where higher levels of processing are needed along with a larger number of interconnects. 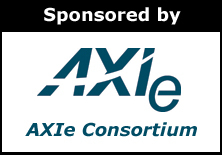 Our AXIe Consortium LinkedIn membership numbers continue to increase and we are now a community of over 300 members. Most recently Test and Measurement World awarded its Best in Test Award 2013 in the category of signal analyzers to Agilent for its AXIe based High-Speed Digitizer. If you want to stay abreast of the AXIe standard you can subscribe to the new AXIe consortium YouTube Channel, or view the latest presentations on the website to see which applications can be addressed with products based on the AXIe standard. AXIe Consortium members in the technical and marketing committees and the board of directors held a meeting in Loveland, Colorado in March. This meeting is described in the Inside the AXIe Consortium article. The Agilent 12-bit, 8 channels AXIe digitizer was elected as the 2013 TM Best in Test winner of the category signal analyzer. Meet with the different RD engineers that developed it. We have recently let our RD engineers speak about how they were seeing the different innovations that have been developed during the conception of the 12-bit AXIe digitizer which has been elected as the 2013 TM Best in Test in the product category “signal analyzer”. Here is a summary of the different posts. Following the win of the T&M Award “Best in Test” in the category signal analyzer of our latest product, the 12-bit 8 channels AXIe digitizer, we will take you during the next 2 weeks on a tour of the technology breakthroughs that needed to be developed in order to release this new digitizer. It should also help you understand how the Agilent high-speed ADC technology team responds to the highest demands in terms of performances, reliability and time to market. It was obvious to us to start with the interview of our AXIe R&D project manager, Pierre-François. I recently spent two days in Loveland, Colorado at an AXIe Consortium meeting. For those of you unfamiliar with AXIe, you may find a short video tutorial here. AXIe is an open modular standard similar to PXI or VXI, but based on the AdvancedTCA industrial computing architecture. The way to think about it is as the “big brother” to PXI- as it uses PCIe (PCI Express) as it’s data fabric, but with a large board size, similar to that of VXI. It is often deployed in a horizontal chassis to minimize rack height, and can be easily integrated with PXI. In full disclosure, I am a member of the AXIe Consortium via my company Modular Methods and serve as a director on its Board of Directors. I am also a member of the PXI, VXI, and IVI consortia. What are consortia all about? The fundamental mission of any open system consortium is to create a specification that allows interoperability between the products from multiple vendors, and therefore creates an ecosystem of products, systems, and applications greater than that of any single vendor. It is an interesting mixture of competition and cooperation. The vendors cooperate to ensure the robustness of the standard (which is no easy task), while competing on products and applications. I had the fortune to speak with Dr. Steven Shipman, a chemistry professor at New College of Florida. He’s a rotational spectroscopist, which means he watches how molecules rotate, and uses that to learn about them. A molecule’s rotation is a function of its three dimensional shape, so its rotational spectrum acts as a “molecular fingerprint”, unique to it. While rotational spectroscopy has many applications, Dr. Shipman’s research focuses on astrochemistry. He is trying to find out how and why complex molecules formed in interstellar space, and ultimately how our life-bearing planet came to be the way it is. 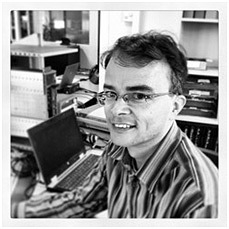 Along the way, he also has interest in continually pushing the technology to make better and faster measurements. That’s where AXIe comes in. To understand the measurement challenge, it is important to understand how rotational spectroscopy measurements are made. A chirped pulse is created that shifts from 0 to 5GHz in 250ns. To create this chirped pulse, Dr. Shipman uses an AXIe Arbitrary Waveform Generator, the Agilent M8190A. It is a two channel AWG in a double-wide AXIe module that can sample up to 12Gs/s. This pulse is filtered, frequency shifted up to 26.5GHz, and amplified using a variety of external microwave components.